Today we welcome an up-and-coming raw chef, Sam, from DebbieDoesRaw for the first of Pure Jeevan's new Makin' It Monday "Guest Raw Chef" editions. Sam will demonstrate how to make a simple Peach Pudding, which she tells us is the invention of her very good friend Anthony from Rawmodel.com. We think Sam did a super job! Don't you ! Sam, you're welcome to guest-host on our blog any time you like. Read more: Makin' It Monday "Guest Raw Chef" Edition Welcomes Sam! The raw food movement isn't creeping along anymore! Just recently I wrote that Angela Stokes was interviewed by CNN about her miraculous weight loss on the raw food diet. Well, today the shining star for the raw food community is none other than Philip McCluskey! He was a guest on CBS's nationally syndicated show called "The Doctors." Philip, if you don't already know, is down 200 pounds and his entire life has changed on raw foods. Like so many others, he is actively spreading the word about raw foods and health. I don't watch TV, but we do have a television set for watching occasional DVDs. So, I planned on turning the set on and actually watching TV for the first time in I don't remember how long! However, I turned it on and realized I don't even know on what channel CBS is located. I tried to flip through the channels, but our TV doesn't automatically let you scan through channels for some reason. So, I was manually pressing and entering numbers into the remote control, but never found the correct channel. I'm sure I didn't miss it, however. In this community, we're all about supporting each other and spreading the word about raw foods and health. I am certain that within a few hours there will be a video up on YouTube of Philip's shining moment on CBS. Once it's available, I'll edit this post and include the video! 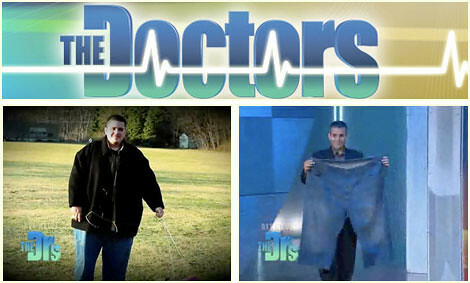 Read more: Philip McCluskey and Raw Food Diet on CBS's "The Doctors"
We went absolutely nuts for these little "pizzas." They were both tasty and fun. If memory serves, I believe she made them by taking slices of firm roma tomatoes, spooning on some improvised pesto sauce that she whipped up, sprinkling on some chopped basil leaves, sprinkling on some "cheese" that she made with ground Brazil nuts, garlic, and salt, and then topping each "pizza slice" off with a half cherry tomato. No recipes necessary here; just take a look at the picture & go try it! If you ve been a Pure Jeevan family member for a while, you know we don t always focus on food in regards to health. Health isn t only about the food you put into your body; it s about so much more. We are mental, spiritual, emotional, physical beings who thrive best when we have a balance in all those areas of our lives. Humans are, for the most part, social beings. If we lack something as vital as social interaction, we become out of balance. As young children, our primary social interaction is through direct contact with our parents and close family members. As we mature, almost all of us develop friendships with individuals outside of our family s social circle. Friendship is essential in helping us maintain a healthy balanced life. Thanks to everyone for the motion sickness tips! Wendi's feeling better, but after such a long train ride, she and KDcat still feel the effects on their balance (feeling like they're still moving, slightly dizzy, ears blocked a bit etc.). I suppose train travel takes a little getting used to. But, again, they're feeling much better. Even though it was a short stay in Portland, they managed to squeeze in a meetup with two Pure Jeevan family members, Ann Chatterton and Tracy Partridge Johnson (as well as Ann's children, Zoe and Zack, and Tracy's son Brandon). They met up at the Blossoming Lotus, an organic/vegan venue that offers some gourmet raw dishes. Here's a slideshow! We may never fully comprehend the mysteries of life and death. One thing is for certain, however, with both we experience tremendous amounts of emotion. At this moment, we are experiencing extreme sorrow after the still birth of our niece, Elizabeth Marie. She was named after my mother who died a few years ago. During this period of tremendous grief, we will be spending time with my dear sister and her family, offering our love and support. I was standing in line at the grocery store the other day and plopped a package of chicken wings up onto the conveyor belt. The cashier made some sort of smalltalk -- I think she asked whether I liked wings -- which prompted me to say, "Oh, the chicken is for my dog, Julia." She looked at me, eyebrows raised. "For your dog "
Welcome to Pure Jeevan's "Juice-a-Day Jamboree"! You're probably wondering, "What IS Pure Jeevan's Juice-a-Day Jamboree, anyway " Well, it's simple: It's an ongoing, informal, loosely organized "event" centered around juicing. Think of it as an interim step between (1) any kind of diet or lifestyle, from SAD to full-on raw, that does not include much regular juice, and (2) an all out juice feast where that's ALL you'd consume for a period of time. Basically, we're saying, "Let's just make this simple and accessible for everyone. Let's just make a goal to simply drink more fresh juice!" Wendi and I have been thinking a lot about incorporating more juicing into our lives lately (which is something we've done off and on over the years but never stuck with long-term). One thing holding us back from doing it more often is the time requirement. When we juice, it usually takes a half hour or so from start to finish. I know it doesn't seem that complicated, but I suppose it's just the whole process of setting up the juicer, washing and peeling the produce, juicing it, setting the juice aside while we clean the juicer, doling out the juice into glasses, cleaning up the mini-mess that makes, and then sitting down to actually enjoy the juice. Read more: Join the Juice-a-Day Jamboree! Yesterday's smoothie was superlatively tasty, eh? It was clearly something out of Elvis' more energetic younger years, I think. You're probably wondering: "How does one follow an Elvis smoothie?!" I know ... it'll be tough to do.